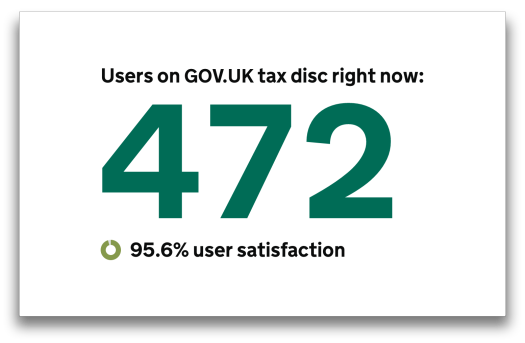 The Performance Platform exposes a lot of service data to interested parties, both within government and outside of it. We thought it would be interesting to tap into the platform, pluck out individual pieces of data and present them in a different way. As someone who’s mostly comfortable hacking around with the html / css / js triumvirate I chose to use the “web platform” as opposed to anything else. Design and sketching was done in code for speed. Google Chrome running in fullscreen mode displays the Heroku page when a connection is available. When offline is needed, a local install can be used instead. Each “screen” consists of an html page, a script, and a css file. The cycling container consists of a set of iframes animated with css. Honestly. As accessibility, bandwidth, and browser compatibility weren’t an issue for this project I chose the path of least resistance and simply used jQuery to fetch and insert what I needed. 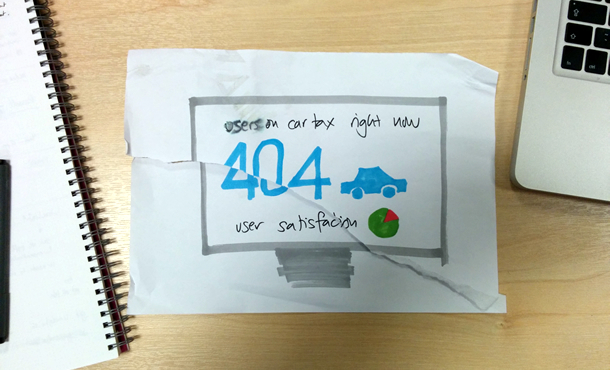 A project like this one isn’t really appropriate to host on www.gov.uk itself, so cross domain requests to www.gov.uk/performance need to be handled. A wee Sinatra app was made to deal with this. It acts as a proxy and simple server, displaying the html pages and grabbing data from the Performance Platform. Out and about doing presentations, there’s always a risk of being offline. A toggle variable was built in, that simply loads locally saved json files, rather than fetching them from the Performance Platform. "The code is a bit bleurgh. Couldn’t you have…"
doing a general code audit - tidy up all the scruffiness! 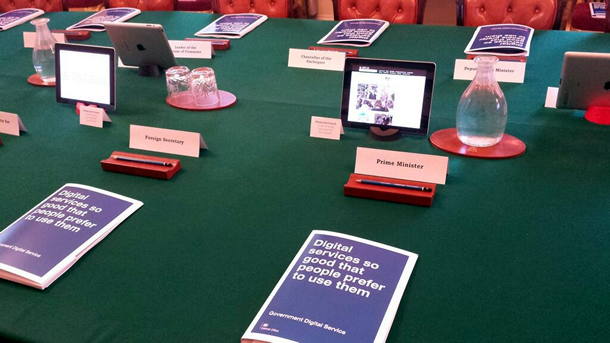 The Cabinet Office meeting, lurking on iPads. The Open Government Partnership summit. 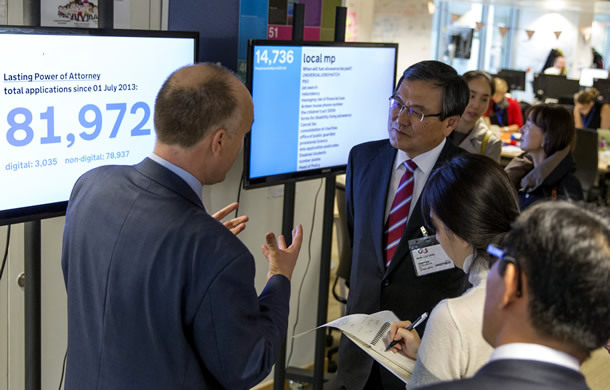 And, most recently, during a visit from the Korean Minister of Science, ICT and Future Planning. Take a look at the data yourself, or check out the project on GitHub. 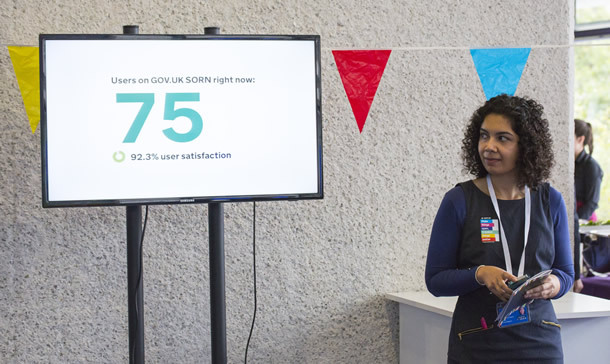 Governmental performance highlights on the big screen, so much more purposeful than 'Match of The Day'. Data is the fundamental factor of any project progress, thanks for sharing.